How this 50-something teacher transformed into a bodybuilder, coach, and author. 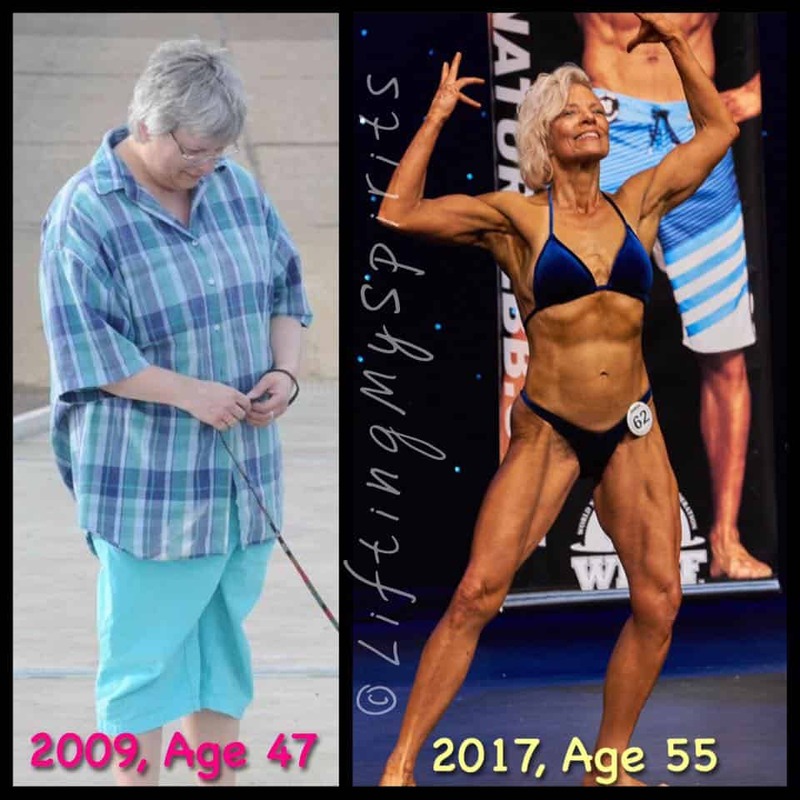 Loving wife, math teacher, and…after a couple decades of dreaming…a bodybuilder. Sometime back in the 80’s, before teaching, before marriage, I had a job as a receptionist at a commercial gym. That’s when I first learned about bodybuilding. I remember watching a competitor eating tuna on a baked potato and was fascinated. My idols were Cory Everson, Carla Dunlap, Lori Bowen, Gladys Portugues… all those 80’s bodybuilders. But I was young and not serious about anything. There is no way I could have followed that path then. When I was 29, my mother passed suddenly from a brain aneurysm. She was only 56, but she was not healthy. She had a lot of stress, didn’t eat very well, and smoked. A hard marriage and then a rough divorce left her a single mom of two teenagers. She did not have a college degree, but always pushed me to get one. I dropped out the first time I went to college. After she died, I became a serious, goal-orientated adult. I went back to college, earned a math degree, and started teaching. “Serious” plus “disciplined” quickly led to “workaholic”. I achieved a bunch of stuff as a teacher, but lost perspective about life, lost myself, and my health. By 2009, after many attempts to ‘lose a little weight’, I weighed the most I’ve ever weighed, was on high blood pressure meds for a few years, and my doctor was thinking about cholesterol meds next. One Sunday afternoon in March of 2009, I had chest pains that would not subside. My husband took me to the ER. I was admitted, tested, and observed for several hours. My age at the time (47), my gender, and my general health status made me a likely candidate for a cardiac event. They determined that it was an anxiety attack – this time. Those words were emphasized by a few of the medical personnel that day. This. Time. I was lucky. I got a warning shot from God. This. Time. On that day, it stopped being about appearance or size. I had let myself follow my mother’s path. I remember how for years after her death, I would go to bed at night and wonder if I would wake up the next morning. I just assumed it was part of getting older, going through menopause, being busy, not having money to spend on fitness stuff, etc. But after that ER visit, I realized that I was going to spend time and money on my health one way or the other. I choose to spend it to invest in a positive result. I took a couple months to research things and make a plan. In June 2009, I bought a Bodybugg and started working with a nutrition coach. A year later, I had lost 30 pounds and plateaued. After a year of diet and cardio, I realized I spent my cardio time at the gym watching the people who were lifting. And then I remembered…bodybuilding. Didn’t I always want to do that? Why did I forget that? I was scared, though. I knew I’d look foolish. And then God provided another push. He helped me find an old friend from high school that I had always thought was a fearless badass- Paula. She inspired me as an example of how to do things that scare you a little bit. Sadly, she developed breast cancer and passed just a few months after we reconnected. But the few conversations I had with her made me brave enough to set up the first appointment with a trainer. I knew if I could find the courage to show up for the first appointment, it was just a matter of following a path someone else would lay out for me. That’s how I met Nico and I told him my scary plan – “I want to compete in two years, in 2012, when I’m 50. Teach me to lift like a guy.” And that’s where this blog begins – in 2010 when I announced to everyone that this was going to happen. And I made it happen. It was not easy to change everything. My blog documents my path, what I learned, and how I felt. It was a bumpy process with many mistakes. But I figured out what works for me – I don’t quit. I competed in 2012 and 2013 in the women’s physique division. In the fall of 2013, I competed in an unsanctioned strongman competition. It was fun, but not my passion. I’m definitely a bodybuilder. At the time of this writing, I have competed five times. I plan to compete again in 2022 when I’m 60 years old. My training now is focused on improving as a bodybuilder – no matter my age. I will be doing this for as long as I’m able to do it. Almost everything in my life has changed and I’m grateful I was able to make those changes. I started working with people as trainer and online coach in 2013 part-time while I was still teaching. In 2018, I retired from teaching, wrote and published my book, and now work as an online coach full time. Lifting fixes me. I love how empowered I feel when I move weight. I use this blog to document the process, to clear my head, and to share what I’ve learned with anyone who wants to know how I changed my life at a time when many my age think it’s too late to change. The bodybuilding part is what keeps me interested because I’m goal-orientated, but the important part is that I’m healthier and happier. I’m so very grateful to God for sending a message too loud to ignore before I killed myself with stress and inactivity. I started this adventure because I was afraid of dying too young. Along the way, I found my bliss. Now, I’m motivated to train just because I love it so much. I will continue to follow the path laid out before me.